Data integration solutions allow businesses to create data transformation jobs and compose these processes in easy to use tools. There are many ready-to-use ETL and ELT tools available that have the features businesses need to build and maintain effective enterprise data warehouses and analytical databases. ETL (Extract, Transform, Load) tools provide connectors to common data sources like databases, flat files, and mainframe systems. They offer a means to implement data transformations easily and consistently across various data sources, and are even integrated with BI tools. Count on ETL for effective filtering, reformatting, sorting, joining, merging, aggregation. ELT (Extract, Load, Transform) tools operate like ETL in terms of graphical development, connectors to common source systems, but push-down transformation to the database. In many cases this enhances performance and developer productivity and simplifies infrastructure and scaling, helping to reduce costs. 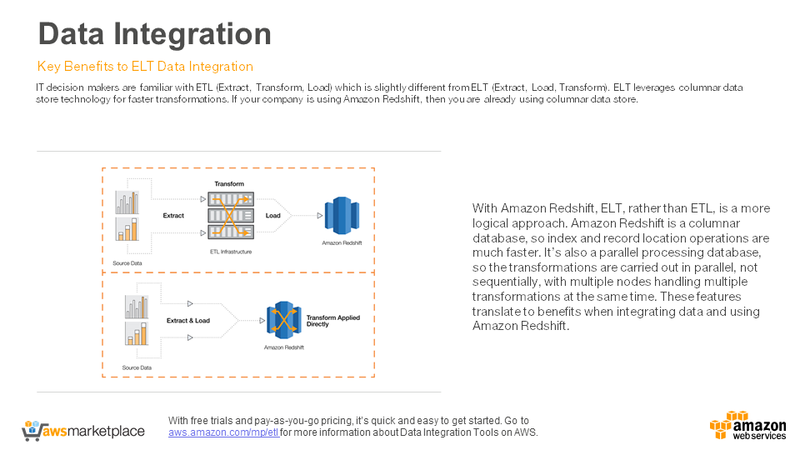 Matillion ETL for Amazon Redshift makes loading and transforming data on Redshift fast, easy, and affordable. Need to cut your ETL development time in half and shave months off your projects? No problem. The AMI takes less than five minutes to set up and delivers results much faster than traditional ETL technologies. With just a few clicks, you can load data into Redshift from from dozens of sources, including S3 and RDS; multiple databases and APIs; common systems like Google Analytics, Salesforce, Netsuite, and SAP; and even social media like Facebook and Twitter. Matillion ETL makes it easy to orchestrate and automate data load and transform, integrate with other systems and AWS services, leverage scripts, and more. Informatica Cloud Data Integration offers native, high performance ETL or ELT for Amazon Redshift, S3 RDS and Aurora and extensive selection of prebuilt connectors for cloud and on-premise sources. Our easy to use visual, codeless-driven solution improves agility, reuse and productivity for all users to easily develop and automatically run data integration, synchronization, task flow and unlimited scheduling. Informatica Cloud supports massive data volumes with advanced scalability features, including automated partitioning, clustering, automated parallel loading into Amazon Redshift cluster and pushdown optimization.